The Queen Package includes 75-minute full-body massage, 5-minute foot scrub, 10-minute facial massage/exfoliation, hot stone and hot towels. Appointment is required. All goods or services must be used by the same person. Merchant's standard 24 hours cancellation policy applies. Merchant is solely responsible to purchasers for the care and quality of the advertised goods and services. Double purchased package can be used for couple at a single session. It is time to slow down and discover how the magic of healing touch replenishes and relaxes your heart and body. Come and let us nurture your tense muscles and your soul with therapeutic massage applied in a Hawaiian-inspired setting. 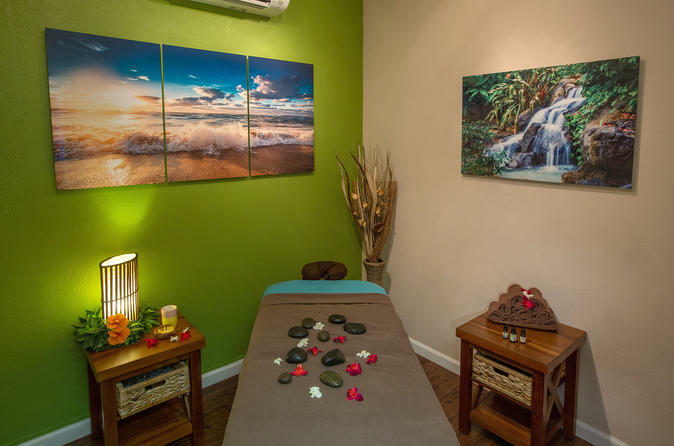 The talented team at Honolulu’s Hawaii Natural Therapy awaits you whether you seek a traditional treatment, or just simply wish to unwind after a long day. We are a wellness massage clinic that integrates a scientific healthcare approach with ancient healing techniques to rejuvenate your entire body. Since Hawaii Natural Therapy is committed to the personal growth and continuing education of our massage therapists, we are able to foster a healing partnership with our clients by combining respect, compassion, cooperation and professionalism with current medical research. Every day we carefully evaluate and improve your experience to exceed your highest expectations. Allow us to be your personal sanctuary of peace and tranquility.